Pink Hen Party Hen Night Sash with hot pink felt text on a fully seemed pink satin nylon sash. Pink Hen Party Hen Night Sash with hot pink felt text on a fully seemed pink satin nylon sash. 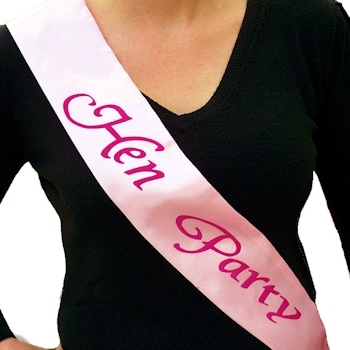 Hen Night Party Sash. Glamorous beauty pageant style double layered satin sash that fits from shoulder to waist.